Please note that the content of this book primarily consists of articles available from Wikipedia or other free sources online. 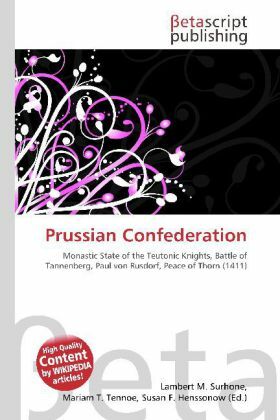 The Prussian Confederation was an organization formed in 1440 by a group of 53 gentry and clergy and 19 cities in Prussia to oppose the monastic state of the Teutonic Knights. According to the 1411 First Peace of Thorn which followed the Teutonic Knights'' defeat in the 1410 Battle of Tannenberg, the Teutonic Order had to pay high reparations to the Kingdom of Poland. Their monastic state imposed high taxes on the cities to raise the funds as well as to re-arm for regaining its Polish-occupied territories. In the 1420s, Grand Master Paul von Rusdorf brought stability to the military order and its relations, but a Polish attack in 1431 resulted in a another Polish-Teutonic war. At that time, Johannes von Baysen was one of Paul von Rusdorf''s ambassadors, as well as an intermediator to the cities.